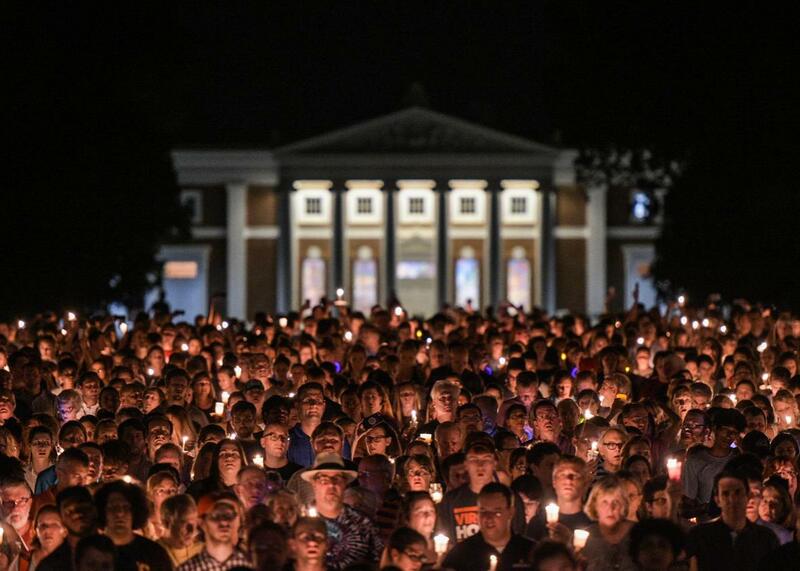 Scenes from UVA’s Wednesday night vigil. UVA Is a Deeply Imperfect Place. Last Night’s Vigil Was the School at Its Best. Hundreds of people march peacefully with lit candles across the University of Virginia campus on Wednesday in Charlottesville, Virginia. CHARLOTTESVILLE, Virginia—Last night a warming onslaught of students, faculty, staff, and greater community members gathered at the University of Virginia to begin healing its campus (or “Grounds,” as its known in Charlottesville) in the aftermath of a violent white supremacist march on the school this past Friday night. Wednesday evening’s event—informally billed as “Take Back the Lawn”—began at a spot known around UVA as “Nameless Field” and culminated on the titular Lawn, a long, rolling stretch of grass at the foot of the Rotunda, the university’s iconic domed building designed by its founder, Thomas Jefferson. The marchers carried candles, sang, talked, listened, laughed, hugged. I do not know exactly how many people came out to march—hundreds at least, and quite possibly more. It doesn’t really matter; what matters is that there were far, far more of us than there were of them. There was a stirring reading of Maya Angelou’s “Still, I Rise,” and, like at nearly any UVA gathering, a chorus of “The Good Old Song,” the school’s de facto alma mater that’s really just a hackneyed rewrite of “Auld Lang Syne” but never sounded as fresh and urgent as it did last night. After the “official” proceedings wrapped many continued to linger, launching into impromptu renditions of “Lean On Me,” “Amazing Grace,” and other songs I was tired of until last night. I have taught at the University of Virginia since 2014, and during that time have come to know it as a complex and deeply imperfect place. Founded by a slaveholder and built by slave labor, the university was a stronghold of Southern white supremacy for much of its history, at times openly virulent, at others insidiously genteel. As late as the 1920s, the university happily accepted financial gifts from the Ku Klux Klan; UVA did not begin to integrate until 1950 and did not begin admitting women until 1970. And despite the many alumni who live in town, UVA’s relationship to broader Charlottesville, and to the city’s black community in particular, has long been fraught. Unwelcome in its classrooms for well over a century, to this day black Charlottesvilleans make up a disproportionate amount of the university’s workforce and support staff, and many are vastly undercompensated. And yet UVA is also special, in real and intoxicating ways. The campus is beautiful, almost comically so, and if you find yourself here in the right mood at the right time of day, it’s hard not to get caught up in the school’s own grand and deeply romantic view of itself. And for all its storied history and traditions, UVA’s greatest assets are its youngest ones: Its students are as intelligent and gifted as any in the country, and fiercely devoted to their school. Their collective reputation has been damaged as of late, as two of last weekend’s most prominent personalities—white supremacist Richard Spencer, and local blogger Jason Kessler, who organized the “Unite the Right” event—are UVA graduates. But Spencer and Kessler are outliers and failures; like so many of UVA’s disgraces, they belong to its past. UVA’s current students are its unwritten future, and the vast majority I’ve known in my time here are much, much closer to the small, heroic band of protesters surrounding the statue of Thomas Jefferson on Friday night than to the hateful thugs and frauds who threatened them. Faculty, of course, don’t have the same relationship to a school that its students do, but our attachment to our students and their well-being provokes its own breed of devotion, protectiveness, and, right now in Charlottesville, fear. The image of neo-Nazis marching on the UVA Lawn last Friday night, where students and faculty families live, was unbearable, and not one that will leave anyone’s mind anytime soon. But last night was a chance to show the country and world another view of the University of Virginia, one that is much closer to who we are, and who we are trying to be.